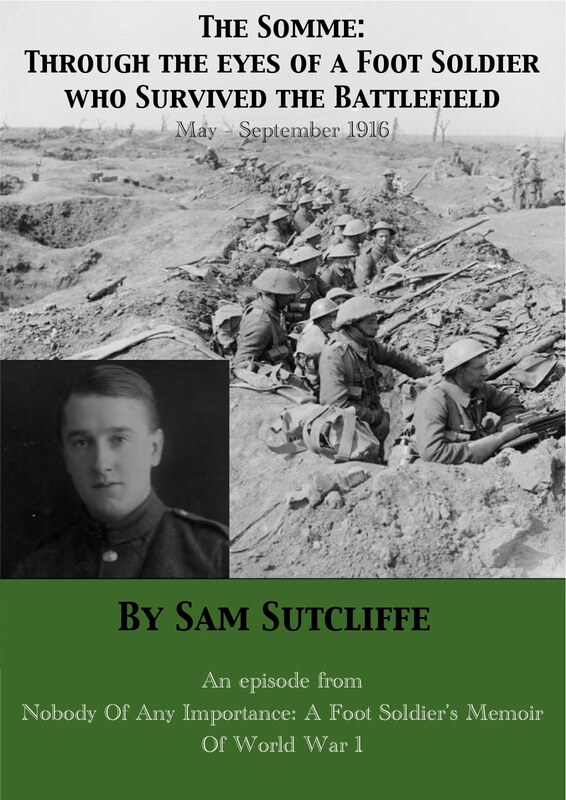 Sam, still under-age, gets the chance to leave the Somme battlefield – um, what should he do? A hundred years ago this week… On the Western Front, the Allies pressed ahead so consistently you might have imagined the war was almost over, not just halfway through. Down in the southern Somme region, victories for the British and French Armies in the adjacent Battles Of Morval (September 25-28; 5,000 Allied casualties, German unknown) and Thiepval Ridge (26-30, the Canadians heavily involved there too; 12,500 Allied casualties, specific German figures not known, but along the Front as a whole they suffered their worst month so far, 135,000)… but an overview would show each costly “win” amounted to an advance of a few thousand yards at best. On the Eastern Front, despite the declared conclusion of the Brusilov Offensive, the Russian Army still moved forward in Ukraine around Brody and Zlota-Liepa (September 30-October 1), and the promising period of new Ally Romania’s ill-fated invasion of Transylvania continued with the opening gambits of their Flamanda Offensive against the Austro-Hungarian and German Armies (September 29-October 5) immediately resulting in a bridgehead across the Danube at Flamanda itself. And down in Greece, the multi-faceted Allied forces gathered in Salonika – British, French, Russians, Italians and the de-patriated Serbs – all made headway against the Bulgarian Army in Greek Macedonia with the Serbs getting to within 25 miles of the campaign’s main objective, Monastir (September 30, now Bitola), when they took Mount Kaymackchlan and pushed onwards. 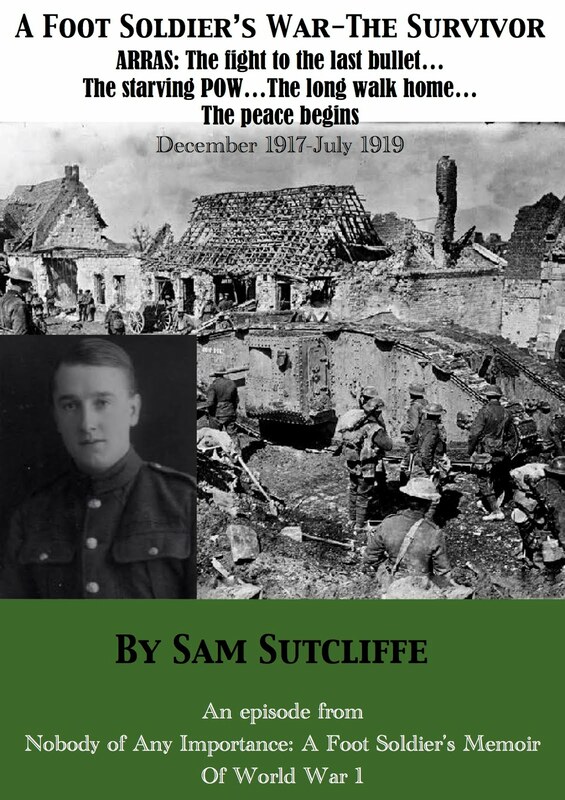 Meanwhile, my father Sam Sutcliffe from Edmonton, north London, 18 on July 6, 1916, and lately promoted to Corporal, had returned from home leave in August to find his Kensingtons Battalion happily resting for a few days at Millencourt-en-Ponthieu, 30-odd miles west of the Somme Front, before moving back into battle further south around Leuze Wood from September 6. Last week, with the Kensingtons installed on the Somme Front around Leuze Wood*, Morval, Bouleaux Wood, Maltz Horn Farm and Falfremont Farm (in action September 9-27), my father resumed his trench mentality – though, to me, with a degree of fatalistic insouciance he hadn’t expressed before, not during the Gallipoli campaign nor around July 1 up at Hébuterne/Gommecourt. “Never a dull moment,” he wrote of the incessant, deadly skirmishing, while nonetheless welcoming the respite afforded by the deep dugouts in the ex-German trenches they manned. So you may be able to appreciate my feelings when, next time out at rest, I was ordered to report to the Regimental Sergeant Major, the big man I’ve told you about, splendid soldier, he who ordered me to put up a second stripe when I didn’t want to**. I entered the room in a half-ruined house he used as an office, stood smartly to attention, announced my name and rank, and he told me to relax. He chatted in a very friendly way — it really did amaze me that the top man of all the NCOs should have any knowledge of me, trying as I always did to play it quietly, lie low and bother nobody. As my father’s editor, I’m introducing an artificial pause here to consider the crosscurrents of emotion in his 18-year-old mind, heart and soul at this point as he faced this decision… what would you do? ‘I had to think very quickly. Then I recalled my letter home during the period when I was feeling, not desperate, but quite bitter about not getting a few days leave, and how my father had relayed that appeal, as his own, to Lloyd George. I realised then that this thing had not stopped with me being given special leave. The rest of it had gone through too and I was to be sent back****. When the RSM saw I was set on that course, I guess he expressed his disappointment. I’m sure he’d expected me to feel honoured by his offer to wangle it for me so I could stay with my Battalion. Probably, my rank as Sergeant in charge of a Platoon would then have been confirmed. * One fatality at Leuze Wood, September 9, was Major Cedric Charles Dickens, aged 27, the great novelist’s grandson, CO of my father’s Company A (or so I deduce from the Kensingtons’ War Diary and Pro Patria Mori, Alan MacDonald’s extraordinarily detailed account of July 1 at Gommecourt). ** My father further praises this RSM in his account of July 1 on the Somme too – see Blog 103 July 26, 2016: ‘… the unshakeable RSM, who won praises from everyone who chanced to be near him during the battle’ (and also, with other surviving Kensingtons officers helped to organise the night-time search for the wounded in No Man’s Land which my father took part in. 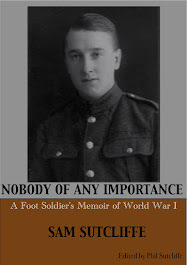 He is never named in the Memoir nor in other accounts I’ve read, including the Battalion WD as far as I can see. It seems this period “out at rest” would probably have been at Morlancourt, where they billeted in houses, and then a place called The Citadel, where the accommodations were tented (September 29-October 3). Given the RSM was quartered in “a half-ruined house” my best guess is that meeting occurred at The Citadel, probably on September 30. *** Sam was 18 on July 6, 1916; conscription of males aged 19 upwards began in January, 1916, and, although the lower limit was further dropped to 18 that May, according to http://www.1914-1918.net/recruitment.htm the law still said a soldier could not be sent into battle overseas until he was 19. 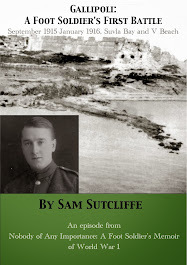 **** See Blog 108 July 17, 1916 – Sam’s father wrote to War Minister Lloyd George both asking that he be granted his first home leave for 18 months (which included Gallipoli and July 1 on the Somme) and pointing our that he was still under-age for combat. Sam promptly got a week’s home leave, in August, and now, he presumed, the Minister’s office was sorting out the age issue too. ***** Unsurprisingly, the Kensingtons’ War Diary makes no mention of my father’s departure and clues to the date are sparse. But, given that his sabbatical from the front line came through just before that “big battle” he mentions a few paragraphs earlier, I think it would have been late September/early October. Because from October 3-9, on the stretch of Front they’d occupied for more than a month, the Battalion took part in an ill-fated action around Billon Farm and then Trônes Wood (October 5-9, the “big battle pending” my father refers to, I deduce), their casualties totalling four officers and 179 ORs (Other Ranks). Battalion CO Lieutenant Colonel HWH Young had made himself unpopular in the hierarchy throughout this campaign (as at Hébuterne, where he was thrust into command of the Kensingtons on June 28!) by complaining to his Brigade superiors about their rearward location, ignorance of the realities of the British trenches, and poor tactical judgement in using the intelligence they gathered from aerial photos and reports. He noted that “about this time [late September] I received a typewritten letter asking me if any of the men would care to submit designs for a Divisional Christmas card”; he saw this as the sort of thing Bruce Bairnsfather might “invent” for a cartoon. He left his post on October 27, his departure as unremarked by the Battalion WD as, probably a few days later, Sam Sutcliffe’s would be. ****** Harfleur: a small port on the banks of the Rivers Seine and Lézarde – back then, three miles from Le Havre, now a suburb; scene of the 1415 Anglo-French battle which inspired the “Once more unto the breach, dear friends…” speech in Shakespeare’s Henry V.
Sam’s back in the old Somme Front routine: getting shot at, getting scared and exhausted – and getting unprecedentedly adjacent to Battalion HQ officers (attracted by the deep German dugouts they’ve occupied?). A hundred years ago this week… An airship raid on London and the East Coast caused 170 casualties, but two Zeppelins were brought down, one by a British fighter plane and the other by anti-aircraft fire (September 23). In a parallel venture, French aircraft dropped several small bombs on the Krupp armaments factory in Essen (24). But the real damage continued on the main battlefronts. To the south of the Somme Front and following The Battle Of Flers-Courcelette, the British, French and New Zealanders (near Flers) proceeded with their modest, costly advances around Morval and Martinpuich (September 18-24), despite German counterattacks on the 20th and 24th. Over on the Eastern Front, the mighty Brusilov Offensive seems to have been declared over on September 20 (it began June 4). A non-historian scanning summaries online, I’ve seen no account of why it finished then, only a note that on that day the Russian Army “repulsed” German attacks on the Narajowska and Stokhod rivers (Ukraine). The Offensive is renowned because it succeeded a) in diverting some German strength away from Verdun, and b) “broke the back” of the Austro-Hungarian Army. It caused the Central Powers Armies 1.5 million casualties, but the Russians own 500,000 casualties are thought to have contributed to the following year’s national collapse and Communist Revolution. Heavy fighting continued in Transylvania throughout the week, with the Romanian Army starting to fall back after their early successes, and the Salonika campaign progressed with French, Russian, British and Serbian forces all playing a part in beating back the Bulgarian invaders of Greek Macedonia - the Allies enforced a naval blockade too (from September 19). Meanwhile, my father Sam Sutcliffe from Edmonton, north London, 18 on July 6, 1916, and lately promoted to Corporal, had returned from home leave in August to find his Kensingtons Battalion happily resting at Millencourt-en-Ponthieu, 30-odd miles west of the Somme Front, before moving back into battle further south around Maricourt and Leuze Wood from September 6. For Sam, a September 1914 volunteer, this followed a ’15-’16 winter at Suvla Bay, Gallipoli with the 2/1st Royal Fusiliers (250 out of 1,000 avoided the lists of shot, shell and disease casualties). They’d sailed to France in late April, where – to their disgust – they were disbanded and transferred to other outfits… Sam to the Kensingtons and the Somme front-line at Hébuterne/Gommecourt, where they’d fought from mid-May onwards. There, on July 1, they’d suffered 59 per cent casualties (see FootSoldierSam’s Blogs dated June 26 and July 3, 2016). Last week, the turmoil of war played a strange trick on Sam and his Kensingtons comrades when they moved into the Maricourt/Leuze Wood sector of the Somme Front. They had the odd pleasure of occupying former German trenches equipped with comfortingly deep dugouts – while their foes took pot shots at them from the rather less commodious former British trenches the upheaval of recent fighting had dumped them in. ‘Never a dull moment, though, up above in the trenches. The close proximity of the front lines made it obligatory on both sides to keep the pot boiling. Short, snappy raids across the intervening, quite narrow No Man’s Land occurred nightly. During daylight, a head shown for a moment above the parapet of the trenches attracted bullets – rifle fire, machine-gun fire; action far more intense than normal in periods between major battles. But we did have that consolation of the comfortable hidey-holes down below with their wooden bunks and reasonably warm temperature. The German trench construction allowed more substantial reserves of dry rations to be stored underground, so feeding the troops from day to day did not rely on the success or otherwise of ration parties reaching the Front from supply depots in the rear. Probably, from the senior officers’ point of view, this set-up was close to the ideal. Normally, we didn’t see senior officers in a real front-line position. They’d be back at Battalion Headquarters. But here HQ had moved forward to these underground complexes. Of course, this did mean more frequent and sharper supervision of the junior officers and their men. And probably the most serious crime in that situation was for a man to be discovered down below when he should have been above or out in the advanced trenches. At least, here the officers and NCOs could organise periods of duty so that we all shared the riskier tasks equally. Certainly, time passed very rapidly there, just doing your job – or appearing to do your bit plus ensuring your own continued existence. Of necessity, it kept you constantly alert. And active. At times, very active. Our first spell of duty up there concluded; quite a large number of casualties sustained*. We withdrew some kilometres to lick our wounds, as it were, reorganise and, no doubt, fill the gaps. Rest at the rear there, some relaxation, short periods of training. A couple of lectures too. One in particular, I recall, acquainted us with the mechanism of the Mills bomb, the British hand grenade at that time. Diagrams showed the bomb’s insides: a fairly large chamber filled with high explosive, the lever on the side secured by a split pin that simply controlled a spring; when you pulled the split pin out with one hand, the lever had to be held in place by the fingers of the throwing hand; then, when you threw the bomb, that lever sprang clear releasing a sharp, pointed dart to pierce a percussion cap which ignited a very touchy explosive called amynol contained in a small copper tube – and set off the larger quantity of TNT. When the explosion occurred, the casing – moulded in small squares – split up into numerous jagged pieces of metal which could do awful damage. * On “loan” to the 15th Brigade, the Kensingtons fought in the vicinity of Combles throughout September, 1916, including involvement in what became known as the Battle Of Morval, September 25-28 (5,000 Allied casualties). ** Mills Bomb: actually patented by a civilian, William Mills, son of a Sunderland shipbuilder, at the Mills munitions factory, Birmingham, 1915; the British Army immediately ordered 300,000 a month, though Mills claimed he lost money on the deal. The grenade did fragment, but not along the moulded lines – they were designed for grip. Grenades seem to have becomer the main infantry weapon at this point as histories are full of references to either side “bombing along” an enemy trench – and that doesn’t mean “running fast”.